As a ‘self-funding group’ we have to source funding for the purchase of a number of essential items including uniform, Personal Protective Equipment (PPE), kit bags, Defibrillators, etc. For example, the type of costs we need to cover include £25 for a uniform polo shirt, £165 for a kit bag through to over £1000 for a defibrillator and £2000 for a Camel Lifting Device. 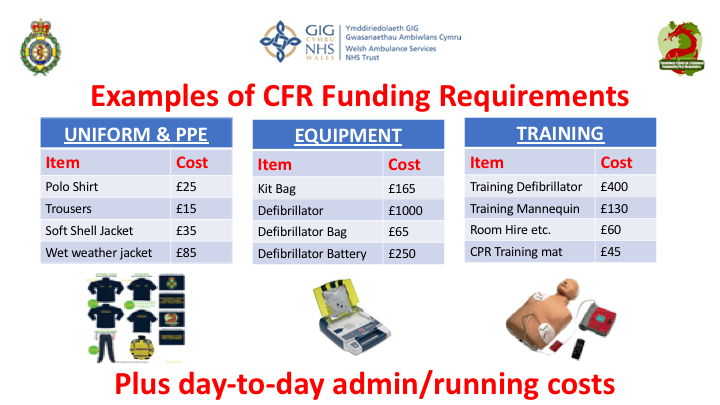 As a team of CFR volunteers, we are always exploring ways of funding the equipment we need to operate, plus allowing us to expand and supply equipment to the team within the Porthcawl area as more volunteers CFR’s come forward and are trained.